Petey was in a moderately better mood today. We have had some virus pass through the family – fever and headache – and he did have it. His whole world has been turned upside down with the stress of moving, vacationing in strange places with strange people, and now setting up shop in a new locale. And unlike his siblings, he doesn’t remember the old friends we’re seeing again. But by the time came for cake today, he was plenty happy and ready for the singing of songs and the blowing out of candles. Let’s talk about that cake, shall we? Poor pathetic cake. I really planned to make it through all my children’s birthdays with just a plain old cake. Maybe some sprinkles. Good enough for me as a kid, good enough for them, right? But somewhere along the way (recently), I got it into my head that I could do something fancier. How hard could it be? I’ve watched Ace of Cakes a few times, and never have I seen six little monkeys and a dog running wild through the shop. Nor have I seen a clingy infant or a miserable tot hanging to a baker’s leg as he tries to put the batter in the oven. That a 13 x 9 pan of cake batter got baked was the first miraculous accomplishment. Then when the birthday boy saw me cutting the cake into a car shape, he pretty much lost it. His older sister had in her head that I was putting matchbox cars on top of the cake (Billy had put pinewood derby cars on a cake for Scouts), so she convinced him that was the plan. I kept correcting them, but to no avail. I should have just put the cars on the cake. Much easier. Fewer tears all around. Somehow I managed to get the cake iced. I think the older kids were left to amuse the baby, and I plunked Peter on the counter and told him that I was going to ice his cake whether he liked it or not. He watched. He licked icing. He declared it, and the cake, good. But the kitchen was hot and humid and there are few spots safe from the beast, so I put the cake in the freezer, which was fine, except that the plate it was on was too big to fit next to the ice maker, so it was sort of balanced on top of some partially empty Popsicle boxes in order to fit. Okay, so yes, I am the one who booby-trapped the freezer for an unsuspecting 4 year old who only wanted to get a pancake out. We didn’t have that cake after dinner, so it stayed there all night, waiting for it’s victim. This morning, she opened the freezer door, and out it tumbled to the ground shattering the dish. I wept. It was only 830 in the morning. Fortunately, the cake was frozen, so I could salvage it, sort of. We have two birthdays coming in August. Oh boy, I can’t wait to see what adventures they bring to my kitchen. Oh my…but I bet it sure tasted great! The cake looks good.It’s festive, joyful, and has icing all over it.I love it.Can I have some? I bet it tasted good — and what funny memories! 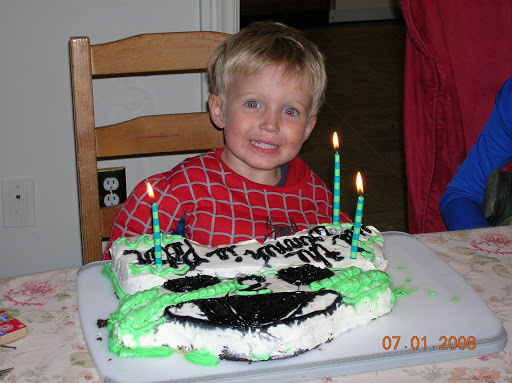 OH boy…That sure is a cute cake, though, and Peter looks like a happy day-after-birthday boy. Love the spidey-wear. Bless you for trying so hard. 🙂And it’s far better than anything I could do.Happy birthday, Peter! nice to see you, Angie! I love the cake! and i love how your ds is in his Spidey outfit! cute!